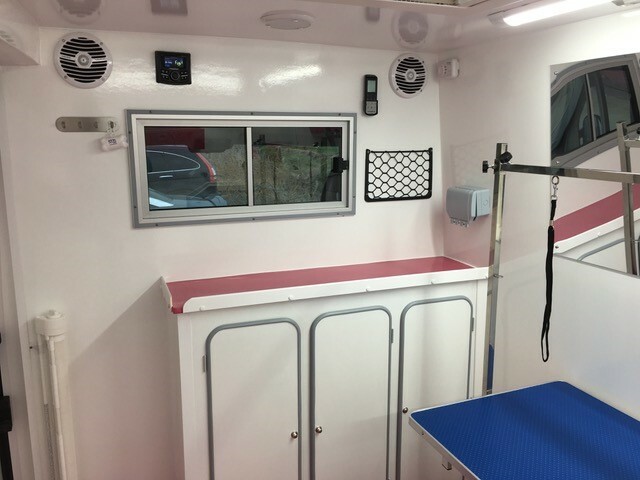 ICW UK Ltd is helping Europe’s leading mobile canine grooming van conversion company shine a light on doggy bathtime! We have been working with K9 Mobile Grooming Supplies in Sussex for the last couple of years, manufacturing and supplying the bulkhead window they offer their customers as an added extra when converting vans into mobile doggy salons. The windows fit into the panel positioned between the cab and the back of the van to provide more natural light. With each van conversion and therefore the dividing panels being different, the windows need to be individually produced to varying sizes. K9 Mobile Grooming Supplies has been in business for about 20 years. 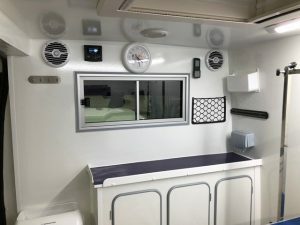 As well as converting vans for mobile dog groomers across Europe they also manufacture a specialised hydrobath which speeds up bathtime while reducing the amount of water and shampoo needed. “Our small team makes all the fibre glass components involved in a van conversion inhouse. Van conversions take about six weeks from start to finish, we pride ourselves on the quality of our work and use British made components wherever we can such as the windows from ICW,” said MD Ben Hartland, a former mobile groomer who took over K9 Mobile Grooming Supplies four years ago. While some of K9’s customers send in their own vans for conversion, most ask the company to source and convert a van for them. The most popular is a Peugeot Boxer as its shape, size and low entry point lends itself well to transforming into a mobile grooming salon. “The bulkhead window is a relatively new option for customers providing them with a view and access into the cab as well as natural light from the windscreen and side windows there. “We found ICW UK Ltd on the web and their service has exceeded our expectations. Having worked with other window suppliers in the past, ICW’s service is outstanding by comparison; they are efficient, the re-order process is nice and simple and they are a trusting and trustworthy company to work with,” commented Ben.